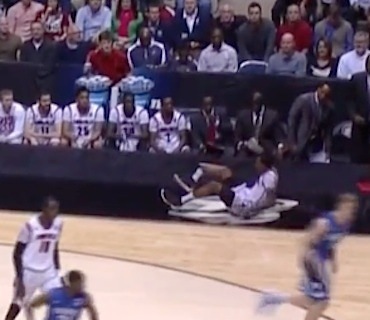 The Louisville Cardinals made it to the final four on Sunday at Lucas Oil Stadium, but before halftime and their 85-63 win over Duke, their guard, sophomore Kevin Ware was lifted onto a stretcher after breaking the bone in his right leg. The injury, a result of landing wrong after jumping to block the ball, is being called the worst ever in basketball. In a cruel twist, Ware said “If God feels it’s supposed to happen, it’s going to happen” just a day earlier during a sit-down with to The Courier-Journal, in regards to playing with his friend, former Tennessee point guard Chris Jones. Here’s a video of the leg turning to rubber, eerily reminiscent of Joe Theismann’s career-ending break. Forward Chane Behanan wore Ware’s jersey, #5, to show support and concerned NCAA Tournament viewers took to Twitter, making #WinForWare and #PrayersForWare trending topics. [UPDATE] There is now an up close photo of the bone coming out of his leg. I would tell you not to look but it’s probably too late. (Sorry.) It’s so gruesome it almost looks like bad horror movie effects.